If you have a garden you know that August is when all the work happens. Oh yes, in the spring there is work getting the soil ready and doing the planting, but all gardeners know the real work happens in August. August is when the harvest happens and when it happens, it happens all at once! If you’ve been reading and following along, you know that in April we planted 5 raised garden beds with all manner of stuff. We added more things as time went on. Some things did incredibly well, while others never managed to even get started. Some of our success stories were the potatoes and the cucumbers. They did very well. Our corn did decent, but we were out of town the weekend it was really ready to be picked, so by the time we got to it, it was a bit past its prime. We had a great showing of basil and the peppers have done better than I expected. We had to pull our brussel sprouts as they got attacked by bugs. The edemame grew a handful of beans, but nothing too exciting there. The cantaloupe and the watermelon fruited, but never grew big. I heard from my local farm stand that many people had that problem with their fruits and vegetables this year. They fruited, but never grew. So, overall, I would say that our garden did reasonably well for our first time with a big garden. We have just planted a few “fall” items, so we haven’t given up on the idea yet! Some of what we have done with our bounty: dill and bread and butter pickles, blanched and froze the corn and a majority of the potatoes. We have made several batches of pesto and frozen it, along with what we have used fresh. 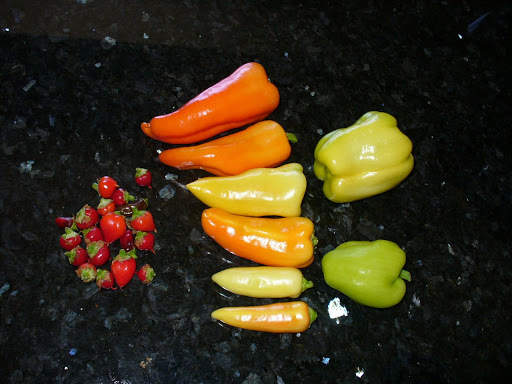 We have had several wonderful homemade salsas using our fresh peppers and some of our own fresh tomatoes. Our tomatoes were one of the things that did not do so well this year. I have been going to the local farm stand every week and buying as much of my produce from there as I can. I also decided that I was going to try a few new things. 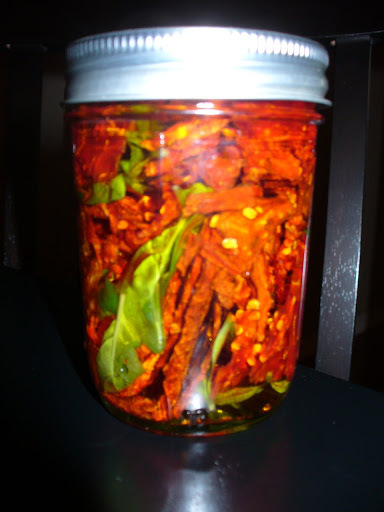 We bought a dehydrator and have dried some of the cayenne peppers and then ground them up for our own fresh cayenne pepper! I have dried peaches, tomatoes, apples and bananas. I have taken some of the dried tomatoes and added some fresh basil and olive oil to a jar and am making my own sun dried tomato and basil infused olive oil. Chris and I also went blackberry picking several times this summer. We have four, very full, gallon bags of frozen blackberries in our freezer, in addition to 4 pints of blackberry freezer jam and two separate blackberry pies. I also prepared and canned 45lbs of tomatoes into a seasoned tomato sauce. That was A LOT of work for 5 quarts of sauce. I might do that a little differently next year. I have made several pints of homemade salsa and canned that as well. 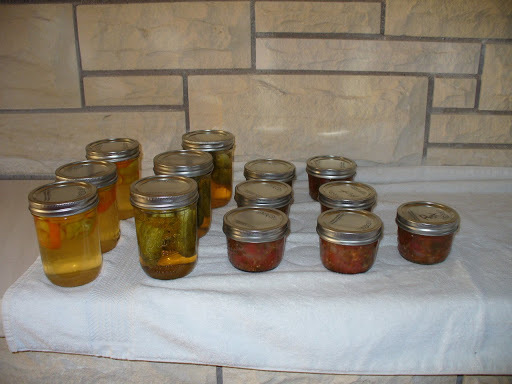 We have both had a lot of fun with all of our garden bounty and the preparation and preserving of that bounty. 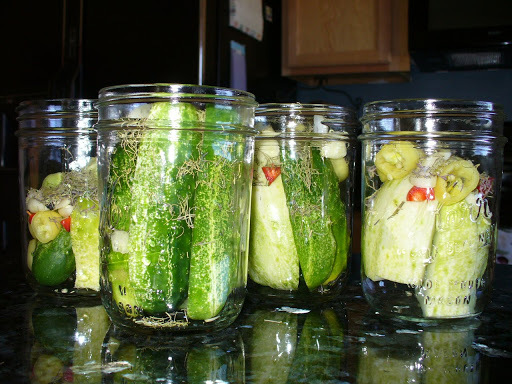 We are looking forward to using our preserved foods throughout the fall and winter. It has been so much fun (and still is) to walk outside and come back in with a handful of this or that to add to our dinner. 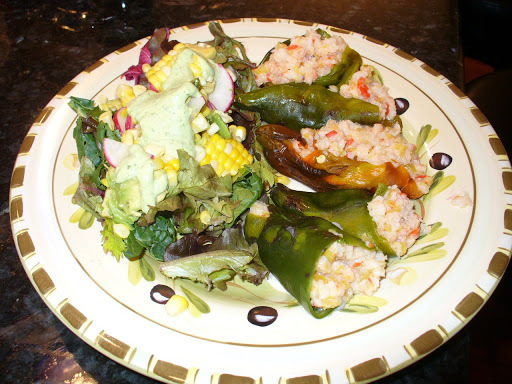 Speaking of, last night I made shrimp stuffed poblano peppers with a side salad of corn, radish and avocado with herb dressing. The poblano’s are fresh from our own garden. It was a very tasty dish. We have made some notes and ideas for changes to our garden for next year, things like more beans and peas, more tomatoes, space the corn out more, etc. The fall garden has been planted with a few things like garlic, onions, some fall lettuces, rutabegas and parsnips. We might add a few other cold weather crops a bit later. 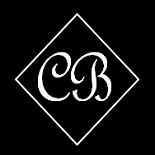 Chris has a plan for building a little greenhouse top over the bed to protect the plants through the winter. As of now, the garden is starting to look a little worse for wear and empty as things are starting to die back and we have pulled several things out already, but we have really enjoyed the process and are excited for next year. 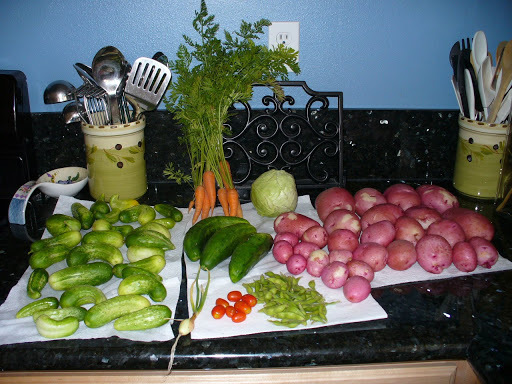 This entry was posted on September 13, 2010 by Corrie Beebe in food, garden.